It feels good to be back after a mini break from blogging. Life has been wonderful with our family having grown two more feet..yes, we have a ‘mini me’ but a boy version who is cooing and wailing, giggling and gurgling his way into our hearts. Now that we are settled and getting into the hang of things, my hands have been itching to cook and bake.Thanks to everyone for checking in on here, for your emails and messages…exactly the reason which has me coming back no matter what! Being a South Indian, rice is a staple at atleast one meal in a day and left-over rice might as well be salt in the pantry. The more uses for it the better. Mash the cooked rice with a fork in a medium bowl. 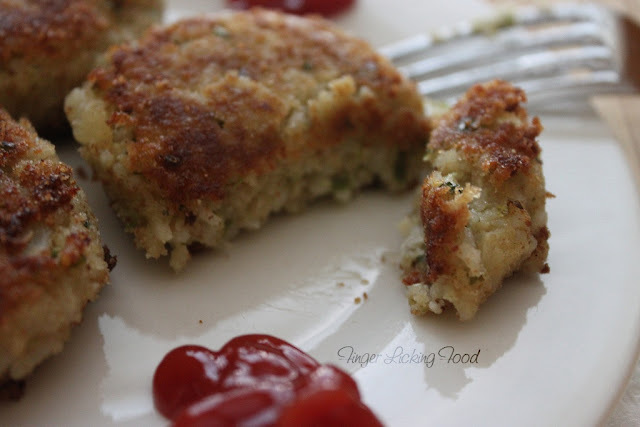 Add the rest of the ingredients and combine to form small patties. Make a thin paste of corn starch and water. 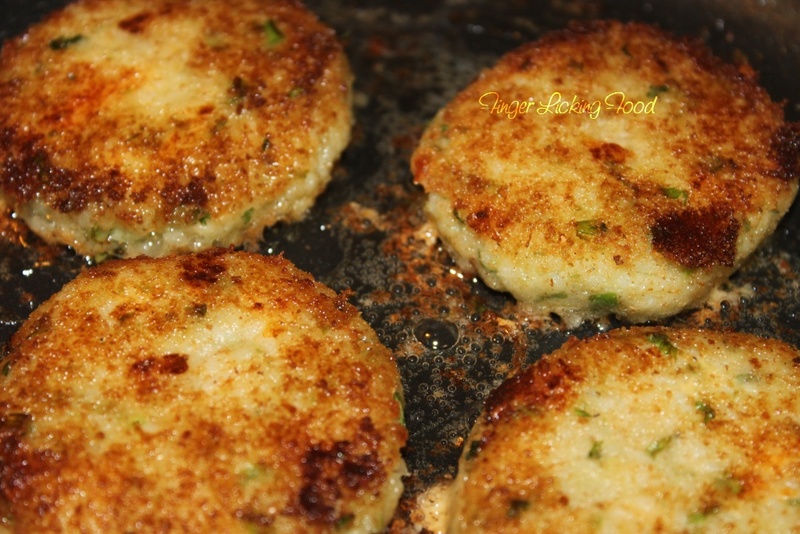 Dip the patties in for a briefly and then dip in bread crumbs to coat evenly. Set aside for 15 minutes. 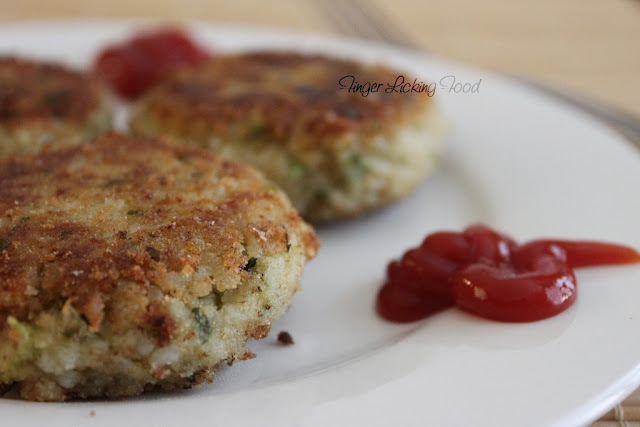 Heat ½ inch of oil in a non-stick pan and fry the patties on both sides until golden brown. Have the heat on medium so that they cook through. Serve hot with ketchup. These are crispy on the outside and soft on the inside. 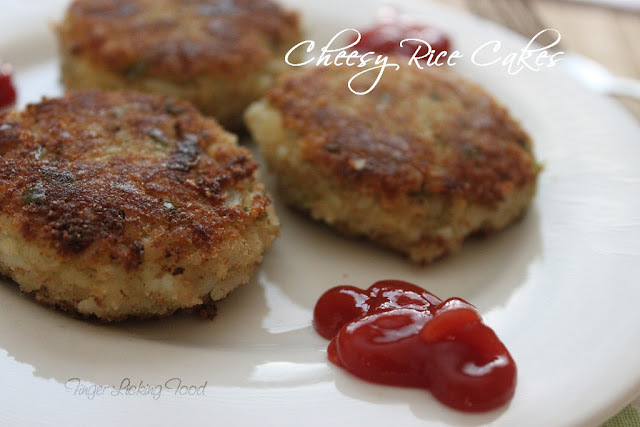 The next time you have left-over rice remember to make these! I have been following your blog for a long long time. even before I ever thought of start my own journey in this sphere. am so happy or you as you start a new journey of being a mom. May God bless your little one. All the best! Congratulations on the baby boy! The patties look so tasty- I often make them with all kinds of leftovers but had not tried rice yet. Hearty Congratulations dear Namratha! :) Wishing your little boy the very best... and enjoy parenthood. Congratulaions namratha..:) Wishing the little boy all the best..
Congrats and hearty welcome to little-boy's-Mommy club!Enjoy your time with the baby, they sure do grow up fast :) Mine will be starting school very soon, unbelievable. Congratulations on your baby boy for starters, but secondly those rice cakes look absolutely fabulous. I will definitely be making them soon. Yum! Congratulations and enjoy your time with the little one. The rice cakes look so yum! Thanks for sharing lovely small patties. I am curious to give it a try as ingredients are easily available. I generally cook Indian Recipes at home but now also interested to experiment few others.